I grew up in the Highlands of Scotland - well kind of. Perhaps the New York of the Highlands is more accurate (Inverness, obviously). But I am also partly of crofting stock so spent a lot of time in very sparsely populated areas. 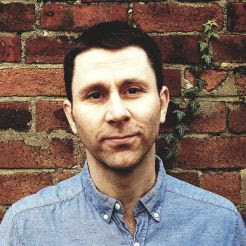 I lived in Liverpool for 5 years and now live in Sheffield and visit London a lot, and I also like looking at maps and making maps. 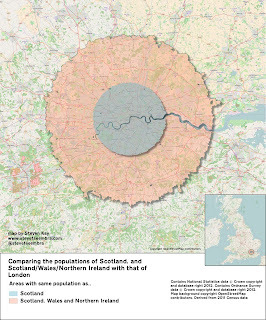 That's why I was particuarly interested in Steven Kay's population comparison map which compared circular areas centred on London to the populations of Scotland, and also Scotland plus Wales and Northern Ireland. Steven has lots of really interesting, clever maps on his website, many of which do this kind of thing. 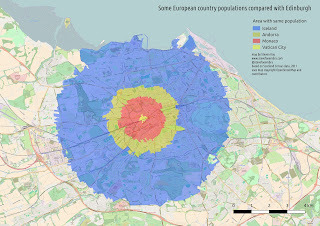 I also really like his Edinburgh comparison with less populated European nations, as you can see below. Obviously, at one level, such graphics don't really tell us that much beyond the fact that some places are really densely populated, and some aren't - and we all know that. But their power lies in the cognitive trick of the simple spatial overlay. By putting them in the same place and simplifying the shapes to roughly circular ones it makes the comparison more powerful and immediate. And this is why it's both easy to understand and quick to digest. It's also what makes me like it as a simple comparison. There are lots of other examples of this kind of thing online, including one I did in the past looking at the Highland local authority area vs Greater London (which is 32+1 authorities, but also a single political space). Talking of the Highlands, the other Steven Kay piece I really liked was his analysis of which parts of Britain and Ireland are closer to Westminster, Dublin, Stavanger, and Oslo respectively. My part of the Highlands is, of course, closer to Stavanger than Westminster. But again, this is just a geographical curiosity and not a reason to suggest we be governed from there! Mind you, their sovereign wealth fund would be nice (current value and nice video - click here). So, where were we - ah yes... These maps are interesting geographical artifacts but they often have a kind of power that connects with people at different levels - including the emotional. But that's a whole other topic. For the time being, it's interesting to note the different responses to my tweet of Steven's map. I only noticed it because I went back into the Flickr QGIS feed the other day to change my password after the Yahoo! hack. 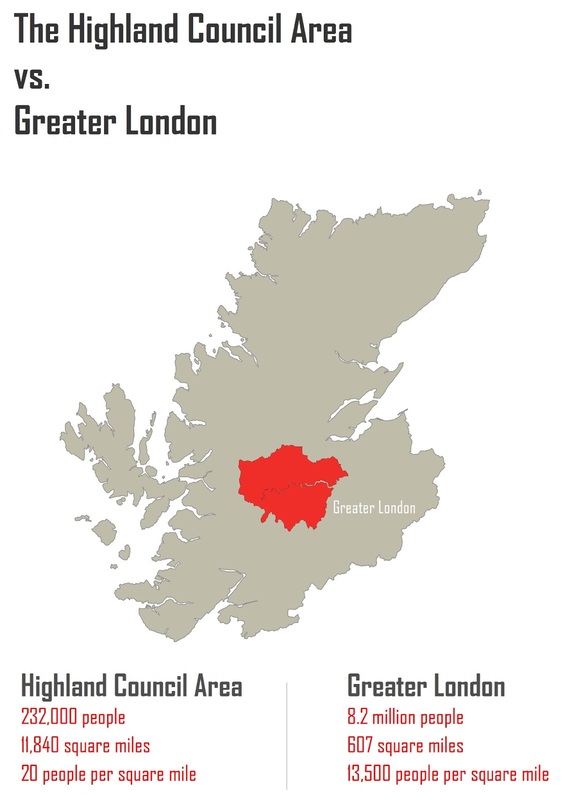 I liked his map because it made an interesting comparison and even though I know London has 'lots of people' and a good few million more than Scotland, seeing it in this way was quite shocking. For some, that might feel threatening (see notes below) but for others - including me - it's just a comparison which captured my attention as a data/map buff. Notes: for map nerds, Alan MacEachren's 1995 'How Maps Work' has some good stuff on how maps are imbued with meaning - Part II from p. 213. The section on map connotation (p. 336 onwards) is quite relevant here. 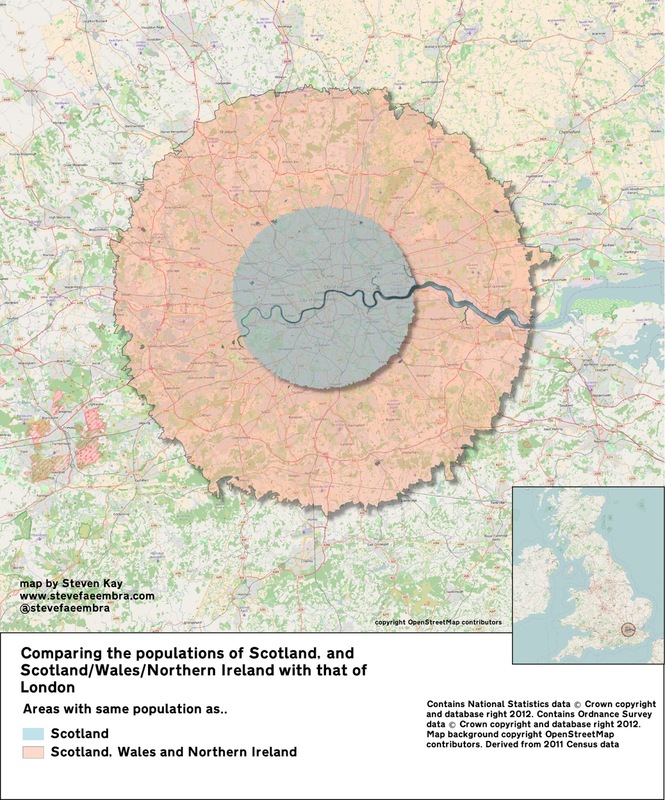 For some, the London/Scotland comparison is immediately annoying because of the nation/city comparison (I have a little sympathy here) and for others there is something of an 'incitive connotation' because of the current state of UK politics and particularly the push for Scottish indepdenence vs continued Westminster governance. While I'm on a roll, I'll add that Norway has about £56bn invested in the UK, including ownership of 50% of Meadowhall in Sheffield and 25% of Regent Street in London. So, if you are ever at a loss for words, impress your friends with this knowledge. 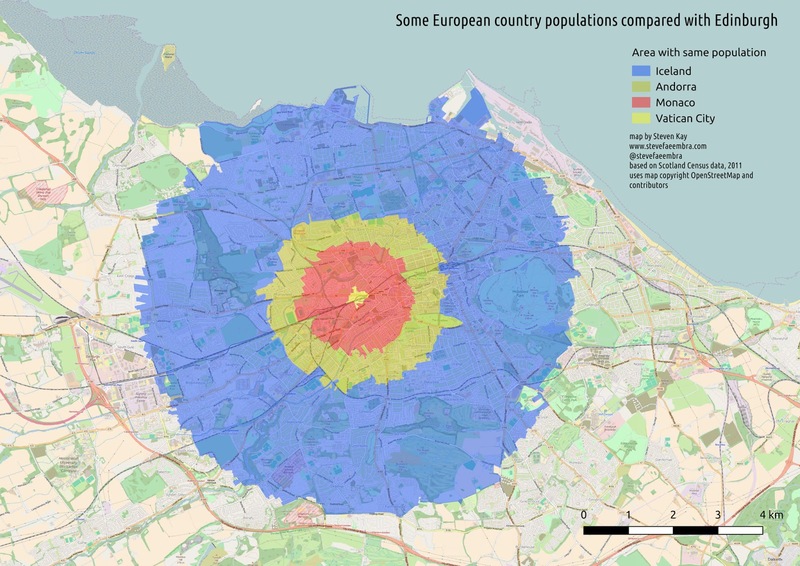 Tenous links here are that I live in Sheffield and Scotland and Norway have similar populations.